A Japanese American woman who lives in Japan is invited to carry a stack of historical kimono to Washington DC from one museum to another, and then to lecture on them. Once she gets there, one of the kimono is stolen, her Japanese tourist acquaintance is killed, her passport goes missing, her parents think she’s dead, her Japanese boyfriend flies over just in time for her to cheat on him with her Scottish ex-boyfriend, some guy starts stalking her, one of the ladies at the museum steals her speech, she discovers eBay, and she almost gets murdered. That seems like it ought to be a pretty interesting book, eh? 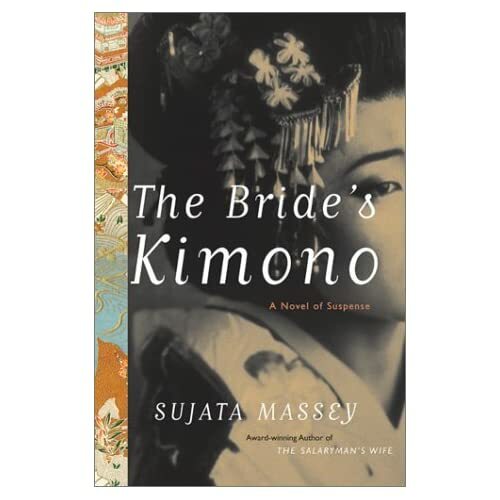 Problem is, The Bride’s Kimono by Sujata Massey is awful. Just awful. I guess it’s part of a series, but I’m not sure how anybody made it far enough past the first book to suggest a second to suggest whatever number in the mess this happens to be. It’s just… egad. Now, granted, this is not exactly an Asian drama. It’s more of an American drama with Asian characters. It’s kind of like half of Japan suddenly showed up in the same place at the same time. So… Yah. Still gonna post a review, anyway. Yup. The main character is Rei Shimura, a 29 year old (I think she’s 29, anyway) woman who refers to everyone by both first and last name, even though she’s American, and we don’t exactly do that here unless it’s for dramatic effect. (This is not the only aspect of her that doesn’t seem to reflect any American upbringing whatsoever, mind you.) She’s pretty conservative, she’s petrified of e-mail (the story takes place in the late 90s), she over-dramatizes way too often, she’s suspicious, she seems to think herself the victim a lot, and she has some pretty wild mood swings. She is, really, a terribly unlikeable character. The writing, meanwhile, is just utterly wretched. So, so forced. So awkward. So repetitive. Not a single part of this flows even remotely naturally. The author felt free to use the same word more than once in a sentence, but she never stopped to contemplate if her dialogue didn’t feel stiffer than a sheet of cardboard tucked into a hunk of cement. She drops brand names, album titles, car models, and food choices willy nilly. The characters are very… I don’t know… Unpleasant. Like, when her parents realize she’s not dead, their immediate reaction is to go shopping for four hundred dollar sandals. Like, what the heck is that, and why was it necessary to write it down??? Oh, and don’t forget the obviously-filler detailed explanation of kimono. Not that that wouldn’t be interesting, but it’s just handled so oddly. She over-explains one minute, under-explains the next. Like… If you’re going to give me a history lesson in my fiction (and I was a history major, so I’m totally okay with being given a history lesson), I want you to at least attempt to make it interesting. The plot drags on quite pointlessly for a very long time, and I was precariously close to the end tonight with no resolution or climax in sight. Then, suddenly, there was the end. Just… Wham! Here’s the bad guy, here’s the conclusion, everything magically falls into place and everybody lives happily ever after. There’s even a glaring plot hole or two that are utterly disregarded. …Like, really? You made me read through all of that, and you didn’t even resolve everything? Geeze! So! Was the concept of the book good? Yessiree, it was. Was the book good? Absolutely not.